The kitchen is the heart of your home, and if you live in an older home, chances are your kitchen could use a little facelift. When a complete remodel is not an option, there are other things you can do to give it a new look. If you’re looking for a new look, here are six powerful ways to update your kitchen on the cheap. Getting new appliances may seem like a big expense, but there are companies that offer affordable kitchen appliances buy now pay later. Going this route allows you to have the new and updated appliances you need while spreading out the cost or delaying the payments altogether. New appliances are sure to give your kitchen a new look. A fresh coat of paint is one of the easiest and cheapest ways to update your space. What was trending when your kitchen was built or last updated is probably not what’s in now. Don’t be afraid to take home a few samples to see which color is right for you. Choosing a satin or semi-gloss is recommended in the kitchen because it’s easier to clean. And don’t shy away from wallpaper either. There are many ways to incorporate wallpaper that are elegant and modern. Try pairing it with crown molding. Light fixtures can really change the way your kitchen looks. There are tons of options to choose from, so it helps to know which lights aren’t realistic in your space or for your decor to help narrow your search. 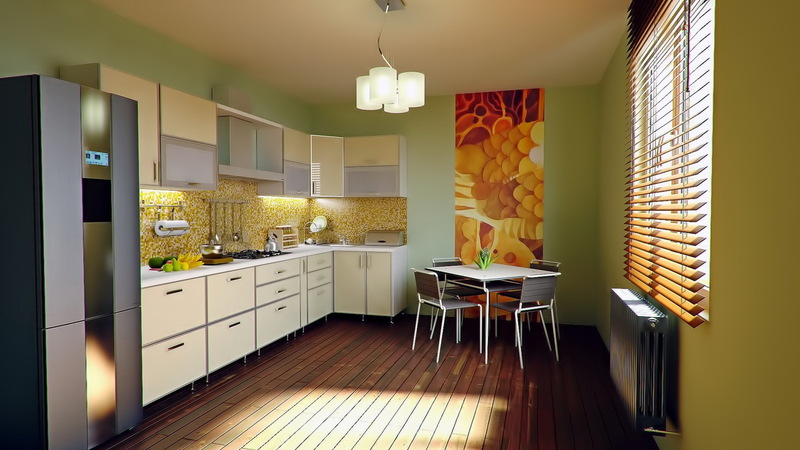 Consider your kitchen’s decor when choosing lighting solutions and the functionality of them. Houzz has some great tips on choosing kitchen lighting. Replacing cabinet doors is a cheaper alternative to replacing your cabinets. Whether you choose ready to assemble doors or semi-custom doors make sure that the doors you choose will fit your cabinet boxes and that they match your existing cabinet boxes. This may require some painting or staining, but it’s still less expensive than replacing the cabinets. A backsplash is a small project that you can likely tackle on your own. Adding mosaic tiles or classic subway tiling can give your kitchen a new glow. If your kitchen is small and cramped, mirrored tiling might be just the thing to open the space and make it look more spacious. Faucets are becoming more modernized as time marches on. There are faucets that have a built-in spray nozzle, motion activated, touch activated and more. Make sure that you pick a tap that is compatible with your sink and the way your water lines are configured. You don’t have to go for a top of the line faucet that costs hundreds of dollars, but just about any faucet will bring a fresh look to your sink area. You can choose one of these inexpensive solutions or a combination of them to breathe new life into an old kitchen. There are many things that can be done short of a total remodel, so don’t be afraid to tackle an update one piece at a time. Doing so can keep you from being overwhelmed or going over budget.